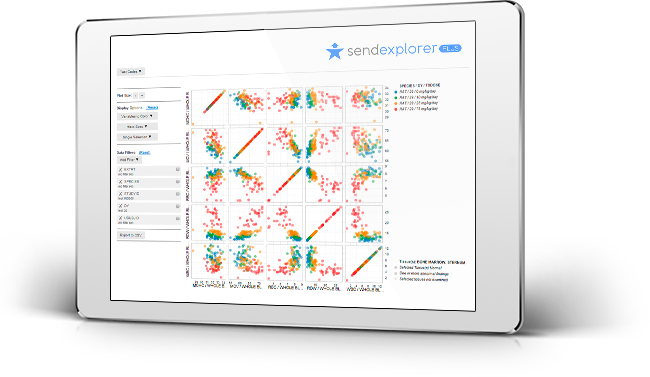 SEND Explorer® provides advanced single and multi-study visualization and analysis capabilities for nonclinical study data in SEND (Standard for Exchange of Nonclinical Data) format. SEND Explorer is an intuitive web-based application with optional data warehousing capabilities allowing data sources other than SEND to be integrated and available for querying and analysis. The SEND Explorer solution suite enables organizations of all sizes to better leverage their investment in SEND data and Submit™ with confidence. SEND Explorer provides single-study functionality including the ability to generate group summarizations with scientifically-relevant visualizations to identify trends and patterns within a study. SEND Explorer Plus includes a database to extend SEND Explorer functionality to the multi-study environment with powerful yet intuitive cross-study querying capabilities and multi-study visualizations. SEND Explorer Warehouse provides a data warehouse infrastructure that empowers Instem’s clients to combine legacy/non-SEND data sources with SEND data. Easily accessed over the Web by a standard browser, SEND Explorer’s flexible pricing plan does not require named users nor does it impose a per-study fee. SEND Explorer can be delivered via the Instem cloud or clients can host the application themselves. submitted with a drug application. Contact us today for more information and a demo. Remember to ask us about a no-risk trial evaluation!